Toshiba 42RV555D review | What Hi-Fi? If you think Sony has a baffling array of flatscreen TVs (you're right, it does), you ought to take a look at the Toshiba website. There you'll find some eight different 40-42in models. This 42in LCD set is in the ‘RV' Series of the Regza range of TVs, and is the first we've seen in this particular class. The 42RV555D is a 1920 x 1080, Full HD resolution screen, capable of displaying the best quality 1080p/24fps content. The 100Hz panel has three HDMI inputs, a Freeview tuner, PC input and optical digital audio output but not for the first time we find ourselves bemoaning a sluggish operating system. Nevertheless, we're soon watching the digital tuner scan for channels. Attempting to enjoy once more the disaster zone that is daytime TV, we can at least admire the picture and sound served-up by the Toshiba. Yes, we did say sound – the 42RV555D's speakers deliver a broad, detailed sound, that certainly set them apart from the larger pack in this Supertest. Images, meanwhile, are crisp and clean, with a decent level of detail and smooth enough handling of motion, as the ever-popular test tool, the Sky Sports News scrolling ticker, helpfully demonstrates. Switch to some video content with bizarre action flick The Fall and the vivid colours lack a little punch and warmth, but the palette is otherwise faithful enough. Again, motion is handled with aplomb – though it's no match for the Sony's fluidity – and insight is impressive, if not capable of the all-out sense of depth and realism that the best on test can uncover. We like what we see with Blu-ray however, the (in theory) cleaned-up Raging Bull shows good contrast levels to deliver decent black shades and clean whites, though there's little this set can do about the on-screen noise. So it can't deliver the extra impact to ‘wow' us like the very best, but the 'RV555D turns in a solid all-round performance at a decent price – just what we expect from Toshiba. 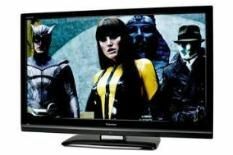 Listen to our March 2009 TV Supertest podcast to find out more about this TV.